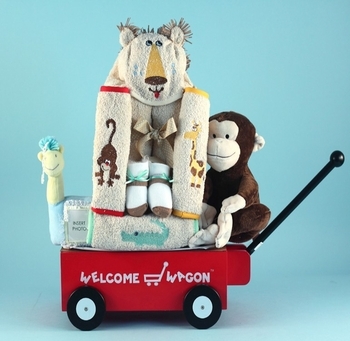 This cute jungle buddies wagon is a fun and unique baby shower gift for any new infant and is sure to be loved by both mom and baby! Featuring an adorable jungle design this is a perfect choice for a girl or boy. We filled it with coordinated bath items and more. The hooded bath towel and washcloths feature the cute embroidered lion on them. All of these are all of the utmost quality and made right here in the USA using only the finest American cotton fabric. Click on More Images above to see a close up photo of the bath set. Bought this for a co-worker who is really into the jungle motif. She has the baby's room decorated with jungle animals all over and naturally she had a jungle theme baby shower too! Everybody thought this was the cutest thing they had ever seen and wanted to know where I found it. She absolutely loved it and she thought I had it custom made for her since it matched everything she bought so perfectly. Processing Time 2-3 business days. Does not include shipping time.